When the Red Sox lost out on the chance to bring back Jon Lester in December, the team wasted little time in securing a southpaw for their righty-dominated rotation. 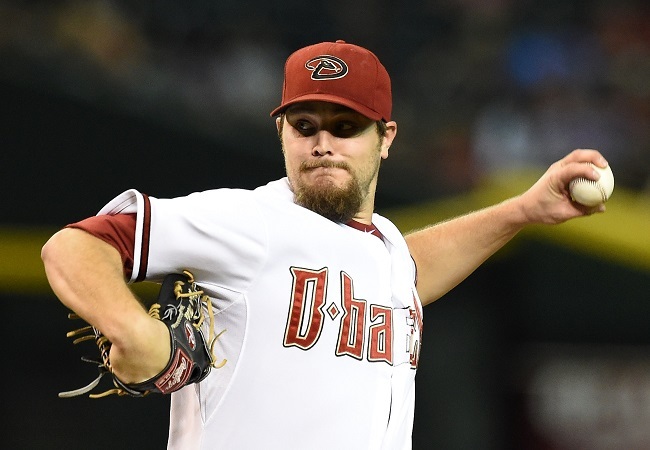 Trading pitchers Rubby De La Rosa and Allen Webster to Arizona for Wade Miley, the Sox acquired a left-hander who averaged over 199 innings per year over his three full seasons in the big leagues. With arbitration looming less than a month before Spring Training, the Red Sox announced on Thursday that they had reached an agreement with Miley to sign a three-year contract extension through 2017. The deal will pay the left-hander $19.25 million over the life of the contract and includes a 2018 club option for $12 million with a $500,000 buyout, according to The Boston Globe's Peter Abraham. For Miley, who made just over $500,000 last season with the Diamondbacks, the contract represents a huge raise. But it could end up being the Red Sox who benefit most from this signing. At 28 years old, Miley has already been named to an All-Star team in 2012 and shown he can be counted on for approximately 200 innings per season. His 33 starts in 2014 were the most of any southpaw in the NL and he was one of just 34 pitchers to top 200 innings. Miley posted a career-high strikeout total in 2014, with his 183 K's tying him for 21st across the majors. His 8-12 record in 2014 may not be especially impressive, but he was backed by a Diamondbacks team that went just 64-98 and scored the sixth-fewest runs in baseball. Provided Miley can replicate his consistency in the American League and hitter-friendly Fenway, the Red Sox appear to have gotten a steal with this deal. On the open market, a pitcher with Miley�s resume could command over $10 million per season. 27-year-old left-hander Brett Anderson, who has similar 162 game average stats to Miley, managed to get a $10 million deal with the Los Angeles Dodgers for 2015, despite not being able to stay healthy since his rookie year in 2009. If he can put together a full, healthy season, Anderson should be able to cash in once he hits free agency this winter. The Red Sox' Opening Day rotation appears to be set � for now � with Clay Buchholz and Joe Kelly being joined by newcomers Miley, Rick Porcello (acquired from the Detroit Tigers in exchange for Yoenis Cespedes) and Justin Masterson (signed as a free agent). Miley is the only left-hander in the group. Their lineup, however, remains to be finalized, as the Sox still face questions of what to do about their surplus of outfielders that includes Hanley Ramirez, Shane Victorino, Rusney Castillo, Mookie Betts, Jackie Bradley, Jr., Allen Craig, Brock Holt, and Daniel Nava. Ramirez is already set in stone as the starting left fielder, leaving the other seven competing for just two remaining outfield spots. But once their outfield situation gets figured out, the Sox hope that their retooled lineup, featuring free agent signings Ramirez and Pablo Sandoval, can help their offense return where it was in their World Series-winning season of 2013, when they led the majors in runs scored, but fell to 18th in 2014.